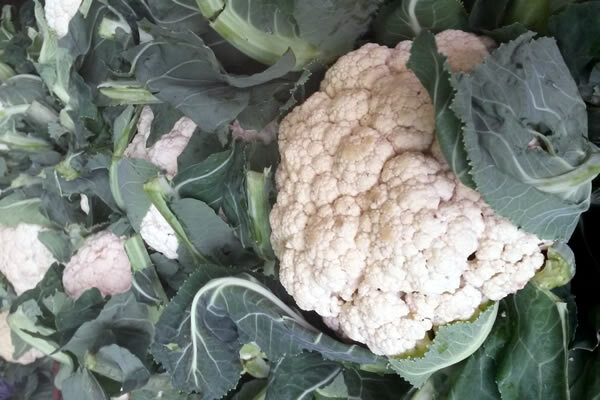 Locally grown cauliflowers are looking wonderful at the moment. I adore cauliflower with cheese sauce, but I’ve recently discovered a few other tasty things to do with cauliflower. It makes a great creamy soup, but my favourite is baked cauliflower. I think it’s amazing how different roasted cauliflower tastes to steamed or boiled cauliflower. Simply cut the florets as you usually would and add them to your roast vegetables at the same time you might add carrots. It’s surprisingly dense vegetable, so you need to make sure it cooks through to tender perfection, but you want the florets to go golden on the outside. What’s your favourite way to eat cauliflower? A new addition to the farmers market is black garlic. Black garlic is made from whole garlic bulbs which are then very slowly fermented. The finished product is totally transformed from what you know as garlic. It is black (obviously) and has wonderful caramel flavours. Black garlic has twice the antioxidants of normal garlic, and is packed with nutrient rich goodness. Sometimes you can get black garlic at the supermarket that is imported from the US. This product tastes strongly of molasses and tastes very much like it should be used in Asian cooking. A Tasmanian product was a finalist in this years’ ABC delicious. produce awards and has a smoky, much more complex, sweeter flavour that can be more readily incorporated in your cooking. Recently, black garlic from Michelago, NSW has been offered at the farmers market. This product is wonderfully sweet and has some citrus flavours. It would be amazing with fish, stuffed in pan fried chicken fillets or served as an accompaniment to poached eggs. Last week, ABC’s Landline reported an international shortage of kale. Thankfully (as long as you get in quick) there’s no shortage of locally grown kale on offer around town. I love this humble, highly nutritious vegetable. There are a crazy number of varieties on offer at the farmers market. There are several organic growers who sell it at the Capital Region Farmers Market. There’s a relatively new stallholder that produces a beautiful frilly purple variety and a few that sell the green frilly varieties. Sometimes you can find kale that are almost ornamental and look like flowers more than vegetables, but still taste amazing. My favourite variety is the Tuscan kale, with long, relatively flat leaves. I love to make a frittata on the weekend with local free range bacon (fried to a crisp), some precooked potato and chopped fresh kale. I crisp up all those ingredients in a small non stick saucepan, then add a pair of beaten eggs seasoned with salt and pepper. Cook it on a low heat, then cover the pan to let it cook through very slowly. You can add a little extra something with some marinaded goat cheese on top. It’s a great one pot brunch packed with flavour, texture and nutrients.